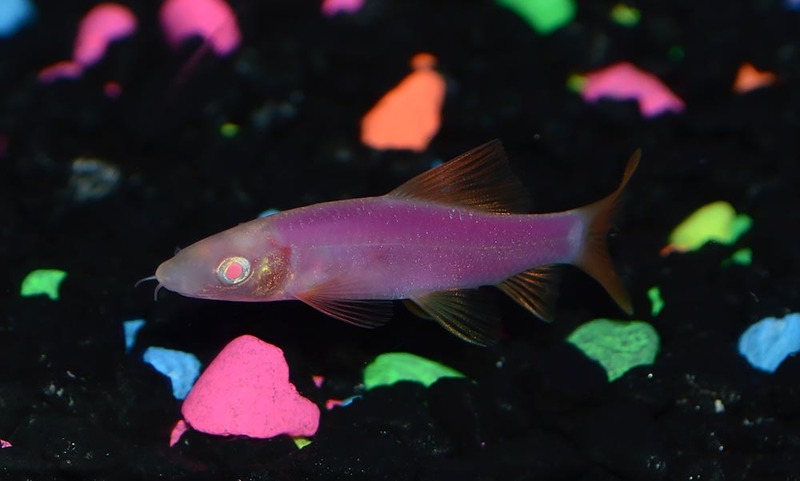 Initially teased in fall 2017 (and on display at the Aquatic Experience – Chicago), the albino form of the Rainbow Shark served as the base canvas for a new GloFish transgenic species, adding bottom-dwelling fish to a popular but controversial product line. Blacksburg, VA, January 15, 2018 – To enhance the colorful fishkeeping experience of GloFish® and expand its livestock selection, Spectrum Brands Pet LLC has introduced GloFish® Sharks to its popular line of GloFish® fluorescent fish. GloFish® Sharks are members of the minnow family, not actual sharks. Since these fish can reach up to 4 inches in length like their counterpart, the Rainbow Shark (Epalzeorhynchos frenatum), they should only be placed in aquariums 20 gallons or larger. While only one shark is recommended for a 20-gallon aquarium, multiple GloFish® Sharks can be kept in aquariums larger than 40 gallons as long as there is ample bottom space for each to establish territory. When placed in an aquarium, GloFish® Sharks exist peacefully with other GloFish® and non-fluorescent community fish, and can receive the same care as their tank mates. They also serve as bottom feeders, giving the added benefit of cleaning up leftover food, unsightly algae, and small nuisance snails. GloFish® Sharks are the latest addition to the GloFish® family, which includes GloFish® Danios, Tetras, and Barbs. Initially, Sharks will be available in two colors: Sunburst Orange® and Galactic Purple®. Like all other GloFish® fluorescent fish, they get their natural color from their parents and are not injected, painted, or dyed. 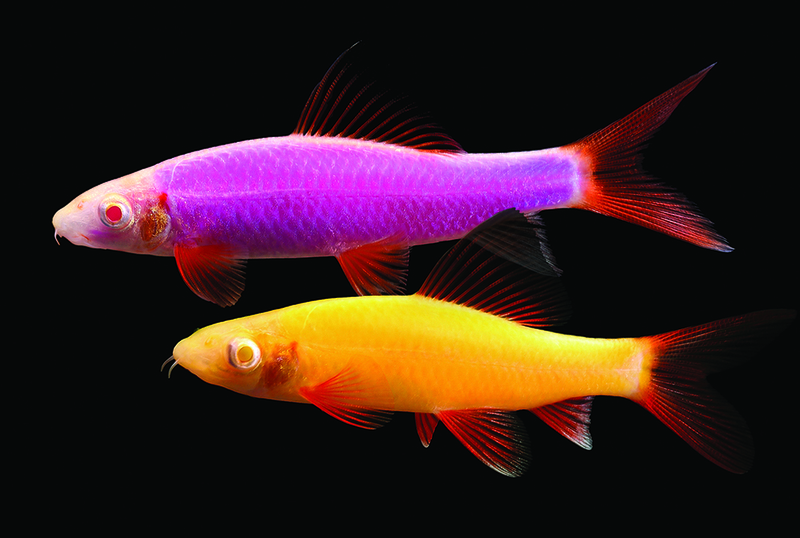 “We’re excited to introduce this dazzling new fish species to our GloFish® line. Every expansion we make can brighten up the days of fishkeepers everywhere,” said Fox. 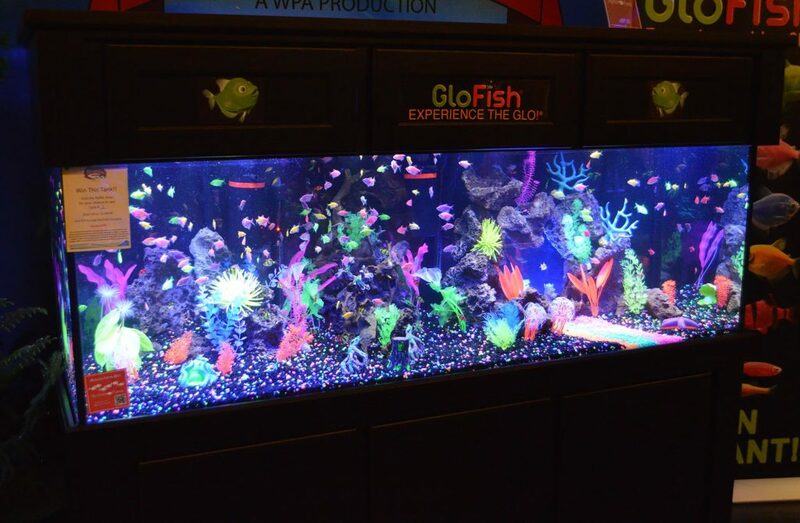 GloFish® fluorescent fish add an alluring array of brilliant colors to any aquarium. Spectrum Brands Pet LLC is an indirect subsidiary of Spectrum Brands Holdings, Inc. Spectrum Brands Holdings (NYSE: SPB), a member of the Russell 1000 Index, is a global and diversified consumer products company and a leading supplier of consumer batteries, residential locksets, residential builders’ hardware, plumbing, shaving and grooming products, personal care products, small household appliances, specialty pet supplies, lawn and garden and home pest control products, personal insect repellents, and auto care products. For more information, visit www.spectrumbrands.com. Glad these Frankenstein creations are banned in the UK. How about making the CEO of the company a similar unearthly colour? No different than having “designer” clownfish in marine aquariums. Not a big fan of these things but at least they are not hybridized malformed monstrosities. No responsible aquarist will support any such modifications (for lack of a better word) to a species. They should be outlawed. I am shocked amazonas promotes these kind of unnatural, genetic produced fish. The way this article is displayed it seems like there is money involved. As a 2 year subscriber I wil not expand my subscription. Amazonas stands for nature in its most natural form. Shame on you amazonas !!! There is a demand for colored fish. Tha alternative to transgenic glo fish is worse. Dyed fish, tattooed fish with poor survival rates and fading and distortion of the color, if they survive. I have seen photos of glo angelfish and other species not yet approved for import. With reduced regulations and lower business taxes, more glo species are likely to appear. I am not a fan of this or of these fish. I am a subscriber and happy to be one and coverage of these sort of Frankenstein fish is not something I look forward to seeing. I have not bought nor would I buy these or any of the glowing fish of dubious origin I have seen. I am a subscriber but I have been labouring under the evidently false impression that your periodical is concerned with wild-type fish and conserving rare and threatened species through careful maintenance and breeding, not diabolical travesties such as these. Unless you publish an apology for running this feature (which reads more like an advertorial) and resist ever giving space to such living perversions ever again, I will be cancelling my subscription. I am completely serious. I am utterly disgusted by this. Shame on you. If we continue to produce and promote these kind of Frankenstein fish it is the suicide of our ornamental fish industry which has plenty natural colored beauties! This is all feeding power to anti-pet organisaties! Be aware because it is for many parts of our industry already too late if you are not pro-active! Cruel inhumane and should be banned! One a misinformed person would buy these freaks! I’m not a fan of these fish, but am surprised of the condemnation I’m reading in the comments above. The strongest statement any of us can make is by our purchasing decisions, not by condemning a publication that reports on them. I doubt I would ever buy one or more of these fish. There is, as one of the comments above stressed, so much natural beauty available — and these, while very colourful, don’t fit my idea of beauty. In disappointed in two things. People’s attention to this fish unnatural look. And people condemning this fish procreation due to it being unnatural when the very fish we buy are bred for the popular genes and colors in the fish we celebrate. We as hobbiest promote breeding for attractive fish, this is our fault. I’d like to see you all jumping towards buying an unattractive fish. I am not a fan of these either but they are less “annoying” to me than balloon crap fish or deformed parrots. I know they are genetically modified but all we see is a different color, and to be opened minded about it, I LOVE all the new discus colors, and angelfish colors and guppy colors etc etc. If we accept those color modifications and don’t complain about some of the gross goldfish modifications, it seems hard to make an argument against GloFish color modifications. One mans gold is another mans poison obviously since people are readily buying deformed balloon mollies and rams and parrots! Ha! you all are ridiculous. These fish are not in pain or tortured to get their unique appearance. Essentially this is no different than the veil-tailed phenotype, the balloon-belly phenotype, or even the albino phenotype we see in several other species we keep as pets. Even the multitude of angelfish markings (other than the standard wild silver type) we see in pet stores are freaks of nature, should we boycott all of these fish? Honestly, this is even more humane than breeding the smash-face dog breeds like bull dogs and pugs because the “glo” phenotype, to my knowledge, does not cause health problems unlike what we see with the smash face dog breeds. You all need to chill out. Or if you really want to save the world from these atrocious Frankenstein genetics then you need to attack merchants for every non-wild type fish they carry. And have fun with that because that pretry much every merchant in the country… And that would basically make you PETA. I am not saying this is right or wrong but the strong reactions make me wonder how many people realize that so many of today’s very common dogs breeds started out as “un-natural genetics that should be banned”. We should not be surprised that high demand creates a market for this…it’s human nature. Are they putting these Glow DNA into Arowana fish to get some of the supper bright colors you see at shoes or is it just selective breeding like miniature dog breeds. Can wait to go to beach and see a purple women. I am not saying this is right or wrong but the strong reactions make me wonder how many people realize that so many of today's very common dogs breeds started out as "un-natural genetics that should be banned". We should not be surprised that high demand creates a market for this...it's human nature. Ha! you all are ridiculous. These fish are not in pain or tortured to get their unique appearance. Essentially this is no different than the veil-tailed phenotype, the balloon-belly phenotype, or even the albino phenotype we see in several other species we keep as pets. Even the multitude of angelfish markings (other than the standard wild silver type) we see in pet stores are freaks of nature, should we boycott all of these fish? Honestly, this is even more humane than breeding the smash-face dog breeds like bull dogs and pugs because the "glo" phenotype, to my knowledge, does not cause health problems unlike what we see with the smash face dog breeds. You all need to chill out. Or if you really want to save the world from these atrocious Frankenstein genetics then you need to attack merchants for every non-wild type fish they carry. And have fun with that because that pretry much every merchant in the country... And that would basically make you PETA. I am not a fan of these either but they are less "annoying" to me than balloon crap fish or deformed parrots. I know they are genetically modified but all we see is a different color, and to be opened minded about it, I LOVE all the new discus colors, and angelfish colors and guppy colors etc etc. If we accept those color modifications and don't complain about some of the gross goldfish modifications, it seems hard to make an argument against GloFish color modifications. One mans gold is another mans poison obviously since people are readily buying deformed balloon mollies and rams and parrots! In disappointed in two things. People's attention to this fish unnatural look. And people condemning this fish procreation due to it being unnatural when the very fish we buy are bred for the popular genes and colors in the fish we celebrate. We as hobbiest promote breeding for attractive fish, this is our fault. I'd like to see you all jumping towards buying an unattractive fish.